This may not be your cup of tea, but I thought I'd share about a bible study I just finished with my friend LeeAnn. 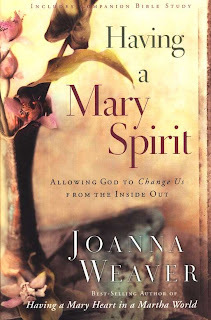 We've been reading the book Having a Mary Spirit by Joanna Weaver. It has a 14 week bible study that goes along with it. Every chapter had something to teach me and I really feel that the author was Spirit-led to write this book. In Having a Mary Spirit, Weaver, author of the bestseller Having a Mary Heart in a Martha World, directs your gaze past your own shortcomings to the God who stands ready, willing, and able to make a new woman out of you. She equips you with biblical insights and practical tools to partner with Christ, inviting him into the hidden places of your soul and giving him full permission to redeem and renovate. Drawing on the stories of biblical Marys and others whose experience with God transformed their lives, Weaver shows how you can find the hope, healing, wholeness, and joy your heart longs for. Whatever stage you're at in your walk with Christ, I'd recommend this book. We also read her first book, Having a Mary Spirit in a Martha World, and found it just as valuable. It has a great lesson on worrying for all you compulsive worriers out there!